A ' DEW-POND is an impervious or watertight hollow artificially excavated on a hill-top, deriving its main supply of water from dew, fog, and mist. It is obvious that every pond must receive a greater or less amount of rainfall, but a real dew-pond does not depend chiefly on that source. Neither is it largely fed by surface drainage, least of all by springs. The name dew-pond is in common use, and is favoured by writers on the subject ; nevertheless, it is partly a misnomer. Dew is an inadequate factor in keeping the ponds full, it is more or less universal throughout a given area, and it affects lowland ponds as well as those of the uplands. Correct notions on this point are desirable, especially if we accept the modern theory of the formation of dew. Dr. John Aitken, in an address delivered before the Royal Society of Edinburgh in 1885, described a series of elaborate and careful experiments made by him in order to ascertain the origin and nature of dew. His conclusions were partially opposed, or at the least supplementary, to those of Wells, whose theory of dew,1 propounded in 1814, had been accepted by all subsequent writers. Dr. Aitken claimed, with some reason, to have demonstrated that the greater part of a deposit of dew is formed of night vapour that has just risen from the ground, and has been trapped and condensed by grass and other objects in its course up-wards.2 This theory, supported by many careful experiments, is, at any rate, worthy of careful consideration, for, if correct, it would imply that a portion of the water of a dew-pond is derived from the pond itself by previous evaporation. To this extent the popular idea of the source of supply of dew-ponds is plainly erroneous. Dew, as we shall shortly see, adds its quota to the supply of the pond, but if this moisture first rises as vapour—a vapour which from accidental circumstances, such as the advent of a slight breeze, may not be laid down as dew—a more comprehensive name must be sought for the ponds. Dew is believed to be deposited without the aid of a cloudy intermediary, the vapour from which it is condensed existing in an invisible state. Again, dew and fog may occur together, and when there is fog hanging over the hills there is generally dew on the grass. The heaviest dew, however, would not deposit from one to two inches of water on the grass, an amount which has been recorded as the rise in level of a dew-pond in a single night. Mr. G. Dines, as quoted by Mr. E. A. Martin, concluded, as the result of observations, that the average annual deposit of dew on the surface of the earth actually falls short of 1.5 inches (see footnote to Table of References, Chapter XIV). Moreover, high downs are much exposed to wind, and dew is with difficulty formed under windy conditions, because the moving air does not remain long enough in one place to allow condensation to take place. In Wiltshire, I have observed that the peasants talk of a ' mist-pond '. An old labourer of eighty, who, until five or six years ago, lived near Worms Heath, Surrey, applied the same term to the pond there. ' Mist-pond ' is also reported from Kent.3 Mr. F. J. Bennett has suggested ' mist-and-rain-pond ', which has the merit of preciseness, but the demerit of length. Even then, ' mist ' must be held to include ' fog ' also. In any event, while we continue to use the name dew-pond, we should remember its draw-backs. As to geographical distribution, the dew-ponds occur most generally on the Chalk Downs of the South and South-East of England. They abound in Sussex and Hants, and are not uncommon in Berks. and Wiltshire. The example illustrated (Fig. 27) is from Surrey. No dew-ponds seem to have been reported from Hertfordshire, but structures by some considered quite analogous, have been noticed on other geological formations in Warwick and Suffolk. Records have been also garnered from the South of Portugal.4 Marshall, in 1798, noticed Yorkshire ponds which had some likeness to our Southern ones.5 The Lincolnshire wold farmer of to-day secures reserves for a dry season by the construction of a huge tank of galvanized iron. Much further information and more extensive records concerning distribution are desirable, but meanwhile it is essential to remember, especially when we discuss the question of age, that absence of dew-ponds in one district and presence in another tells neither way. Other places, other modes ; and this diversity may be as true of water-supply as the variety of contemporary dwellings, customs, and occupations. if a little poetical licence be allowed for unfed ' (not visibly fed). At first thought, the replenishing of a pond during a drought, and the actual diminution which sometimes occurs during a moderately rainy season, are startling and paradoxical facts. The site having been selected, earth is scooped out, much in excess of the requirements. A coating of dry straw is laid over the bottom. Then follows a layer of well-chosen, finely-puddled clay, and over this, again, stones are closely strewn. Lastly, the margins are effectively protected by well-beaten clay.12 The writers lay stress upon the dry straw as an essential part of the structure. Independent inquiry, however, shows that the use of straw is far from being general. I have even heard its employment strenuously denied, but, as with other sweeping statements, some qualification must be made. Where straw is used—if it be still used, it doubtless assists the puddling process, by toughening the clayey floor, and by permitting of expansion and contraction without any cracking of the material. Unhappily for theories, the premiss is not always clear. Messrs. Hubbard make the straw to be the bottom layer ; other writers place it as a middle bed. Much to our loss, White of Selborne gives no account of the making of a dew-pond, but Marshall, who wrote a little later (1798), speaks of the Drinking Ponds ' of the Surrey Downs and describes their construction. Each bason ', as he calls it, was lined with a coat of chalk, six or eight inches thick, beaten down with rammers. Next, a grout or batter, com-posed of pounded chalk and hot lime, was evenly spread over the hollow, to a thickness of half an inch. Two or three other coats were then usually applied, to ' glaze ' the bottom and prevent the ravages of worms. Marshall adds that these sheep ponds should be railed in so as to keep off cattle and horses.19 The method just described differs largely from that given by Messrs. Hubbard, but a survival, or recurrence, of this mode of construction is seen in the cemented or concrete-faced ponds now becoming common. Mr. C. J. Cornish records a dew-pond with a concrete bottom, situated on the Brightstone Downs in the Isle of Wight, which has never run dry for thirty years. Edward Lisle (d. 1722) recommends that artificial ponds should have four equal slopes, and should be ' covered with a gravel or a mortar earth, four or five inches on the tops, which, cattle treading in, will cement with the clay, and bind . . .' This idea of the results of treading is erroneous, but Lisle also advised that the pond should have ' shade ' to prevent the cracking of the clay. Just noticing, as we pass, the allusion to straw, one may observe that the supply from rain-flow would be wash ', that is, mud and water, and this, in time, would tend to choke up the hollow. The best dew-ponds are said to be those of the Sussex Downs, near the sea ; these ponds get the full benefit of sea-fogs, and the first draught of the moist South-West winds. Let us next see if there is unanimity concerning the source of the bulk of the water of these ponds. In other words, are they Mist-ponds or Rain-ponds ? Mr. Slade, in the little treatise before quoted, boldly avers that Rain is the main, if not the whole source of the pond's supply ' 24 And again, Heavy rains increase the value of the rainfall '—a safe statement, surely—' while minor neither increase nor diminish it.' He appends numerous tables of observations upon which his conclusions were based, as well as some graphic representations of the fluctuating supply. In view of more recent experiments, one is driven to believe that there must have been some serious error which vitiated most of Mr. Slade's experiments. Indeed, at the end of his tractate he seems to reveal a little misgiving on his own part, for in a footnote this remark occurs, The annual condensation [presumably by the water of the pond] will be found to bear but a small ratio to the annual rainfall.' 25 Such a statement cannot be accepted as axiomatic. It does admit the agency of fog, but depreciates, on inconclusive evidence, as will be shown, its total effect. It should also be added that Mr. Slade's experiments appear to have been concerned chiefly, if not entirely, with one pond. Aitken's teaching about rising vapour seems here to get support. That twinkle into green and gold." Mr. Clutterbuck gives calculations for ascertaining the volume of the unseen supplies of water, but as he assumes an average daily amount to be consumed by each member of the flock, his conclusions are necessarily faulty, and of vagrant interest only. It will, however, be worth while to step outside the strict limits of our investigation, and ask what explanations of the principle of dew-ponds have been put forward. This done, we must return to our real inquiry, the age and origin of the ponds. Surely the straw must ultimately become wet under any conditions, be the clay rammed never so tightly. Springs may be neglected, as being unusual. Would it not be possible for the straw to get sodden by hydrostatic pressure from below ? We remember, too, that some authorities make the straw the middle layer, not the bottom, as in Messrs. Hubbard's plan. Moreover, as a fact, the tread of animals penetrates the clay crust, and the pond, though impaired in efficiency, yet continues to serve for years. What, too, of those ponds, evidently the majority, in which straw is not used ? Neither Marshall nor Jefferies mentions straw ; inquiry to-day traces it only doubtfully in most districts. Theories based on the non-conductivity of this material could therefore, at most, give only a partial solution ; where the straw is absent, they are worthless. Dry straw, indeed, as already noted, is said by Mr. Collett to be employed by the Berkshire craftsmen when lining the pond at the present day.33 Clutterbuck also mentions straw, though he describes its purpose differently. Speaking of the making of a pond, he remarks, ' As the portions are finished, they are protected from the action of the sun and atmosphere by a covering of straw.' 34 This seems to refer to a temporary loose bed of straw placed over the crust until nightfall arrives and the pond is to start its history. Clutterbuck tells us that when all is finished water is introduced by artificial means. If obtainable, he advises piled-up snow as the readiest and least expensive method of securing a start ; wattled hurdles should be erected to encourage, during a snowstorm, the requisite drifting.35 A century ago, Davis recorded this filling with snow ; the after-supply, he asserted, is kept up by clouds and dew. In the neighbourhood of Calcutta ice is obtained by placing porous earthenware pans of water in an earth cavity lined with rice straw. The straw seems here to have some value. A third hypothesis, propounded in 1900 by Mr. A. Marshall, teaches that there is a difference of electric potential, and therefore an attraction is set up between the innumerable particles of fog-water and the summit of the hill on which the pond is situated. Mr. Marshall suspended two porcelain basins, alike in all respects, by silk threads over a spot on the South Downs. An upright sheet of copper was placed in each basin. One basin was allowed to remain insulated by the silk thread, but the other was earth-connected by wire. During the night of April 1, 1899, when a thick mist prevailed, the bathe the insulated ' screen ' received 155 c.c. of water, the other, with the earth-connected screen, collected 18.0 c.c. The insulated apparatus tended to get an electrical charge from the particles of moisture, therefore the attraction was less than in the apparatus earth-connected. The result was the more remarkable, as the silk soon became saturated, rendering the insulation imperfect.37 I quote Mr. Marshall's account, adding the simple comment that it seems to furnish a probable, though only partial, explanation of the phenomena. To test the ' distilling ' power of trees, Mr. C. J. Cornish placed two vessels out of doors on a dewy evening. One was put under a cherry-tree in full leaf, and the other on stone flags away from trees. The latter vessel would be affected by dew and by the more limited condensation only, the former received the drippings from the cherry-tree. In the morning the vessel under the tree was found to contain twice as much water as the other.40 In the Indian jungle, amid dews and mists, water patters from the trees like rain. Briefly, the predilection of the flock-master for a co-operating tree seems to be justified by results, and we may conclude that trees enhance the efficacy of the pond. A few additional considerations are worth submitting. Wells cites experiments performed by Six, showing that there is a fall in temperature of 1° F. for an ascent of 250-300 feet." Closely connected with this fact, no doubt, is the increase of rainfall in elevated regions, amounting to 3 or 4 per cent. for every 100 feet of rise 42 Again, as noted by Miall, the evaporation on high grounds, owing to the diminished temperature, is less than on low lands." There are times, too, as Baldwin Latham observes, when the water in a pond at great elevation seems to be in direct communication with the clouds, though the sky around is quite clear." The theoretical aspect of dew-ponds has no* been treated with a fullness which may be pardoned in view of the scanty and little-known references to the subject in our scientific literature. We must now return to the high road of our mental journey. We have seen that some of the dew-ponds are modern constructions. We now ask, Are all dew-ponds of recent date ? Mr. Slade, referring to examples in his own district of Wallingford, asserts that dew-ponds were not known there till about the year 1836.45 Thomas Davis notices them in Wiltshire thirty-five years earlier. Mr. Clutter-buck states that in one known instance the increase in the number of dew-ponds has been a matter of definite arrangement between landlord and tenant.46 This, of course, merely proves that dew-ponds are made at the present day. Beyond the early eighteenth century, records do not seem to be available. Folk-memory is wanting, or is, at any rate, bemused by educated influence. If the dew-ponds actually existed at any period previous to the ' wool-growing ' centuries—the fifteenth and sixteenth—their introduction perhaps followed a disconnecting gap. 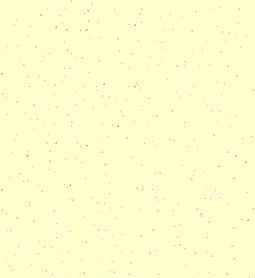 Something of this kind, we have seen, appears to have occurred in connexion with linchets and chalk-wells. It is true that agricultural methods change slowly, and there is a possibility that a few of our extant dew-ponds are survivals from early times, and have been again and again repaired. Bearing in mind the shifting of the old population from the hills to the vales as the woodlands were cleared, I should nevertheless doubt whether the present ponds antedate the period of the Mediaeval sheep-masters. Valley pastures are usually well watered, but when the wolds and downs again came into use as sheep-walks, ponds would be essential accessories. Yet there is a likelihood that dew-ponds of some kind were known to our ancestors of the Neolithic and the Bronze Ages. First, there is forced upon us an a priori probability, amounting almost to conviction, that excavations of this nature must have been known and utilized. Water was needed. Depressions are discoverable in the ground near old settlements, and are not always of the hut-circle type. The primitive settlers of the hill-tops, who have bequeathed to us their camps, barrows, and cultivation terraces, had, above all things, an imperative need of a constant water-supply. To state an example : Within an area of 160 square miles on the South Downs, Mr. A. H. Ahicroft has counted sixteen prehistoric forts, belonging to the Neolithic and Bronze periods ; the number was doubtless once greater. In the absence of direct and positive evidence, we are justified in pursuing the exhaustive or eliminative method of inquiry. Years ago, when General Pitt-Rivers was examining Winklebury, he was struck by the absence of any visible signs of a water-supply. The nearest place where water can be obtained in modern times is at the foot of the hill, 850 yards to the West of the camp.52 A spring on the plain below is traditionally said to have been used in the Middle Ages. Could such sources have been satisfactory in Neolithic times ? We remark, first, that the interior division of the camp was considered by Pitt-Rivers to have been reserved for cattle. The theory that such forts as Winklebury were refuges for men and their herds in times of strife may be indeed taken as rightly well-trusted. But it must not be overlooked for an instant that ancient herdsmen would require water for their flock at all times, in peace or in war. Water must therefore have been found for oxen and sheep as well as for tribesmen. Setting aside the need of adequate supplies for grazing animals, let us admit that a permanent investment of a refuge-fort was an unlikely event. We still have to meet the fact that neither man nor beast can live many days without water, much less could warriors so deprived keep up physical strength for defence. Nor would the quantity of water required be small. Did the inhabitants carry into the camp a supply sufficient for two or three days ? This is doubtful ; first, a hostile inrush would permit little preparation, and secondly, primitive skin bottles and earthenware pans would hardly meet the demand. No ; rather is it a modern question which says, Whence shall we bring water? Primitive man went where the water existed, or could be readily obtained. We may be sure that not even under the severest stress would he live on the hill-tops unless he could easily satisfy this first necessity. Did wells, yet undiscovered, exist within the entrenchments ? We know that Normans, Saxons, and Romans were in the habit of sinking wells. Yet few Roman examples have been discovered on the Chalk Downs. I think that the reason is obvious. The requisite depth of bore would be almost prohibitive of attempts at this kind of work. In his long and painstaking explorations at Cranborne Chase, General Pitt-Rivers discovered no wells on the high ground near the crest of the hills at Rotherly (Wilts.). On the lower levels, at Woodcuts, over the Dorset border, the spade exposed two wells, one of which was proved to be of Roman date by the finding of the remains of a Roman bucket at the bottom. This well was 188 feet in depth.53 Holes or ' put-logs ', 12 inches apart, were cut into the sides of the shaft." The shallower well, driven to a depth of 136 feet only, showed no sign that water had been reached. A modern Woodcuts well, sunk from a level 77 feet below the site of the ancient borings, yielded no water until the rock had been drilled to a depth of 211 feet. And to-day, the only sources of water in the Chase, wherever there are no wells, are dew-ponds and the roofs of buildings. General Pitt-Rivers thought it probable that at Winklebury there may exist wells hitherto unrevealed to the investigator, but, on the whole, he inclined to settle the matter by postulating a much higher water-level in ancient times. Should wells ever be discovered at Winklebury, they will most likely be of Romano-British date. The question is not, however, Did the Romans and Romano-Britons bore wells ? but, Did the earlier folk, equipped with rough spades of bronze and flint and mattocks of deer-horn, essay such a task ? Until we conceive this probable, and can assume that the tribesmen knew that water existed at great depths—until, in short, some Neolithic wells are produced in evidence—we may well hesitate to speak affirmatively. If the dene-holes should be cited as parallel constructions, we would answer that the true dene-hole is seldom even conjecturally Neolithic, or even of Bronze Age. While dour compels one to admit that the tasks of sinking andour a dene-hole and a well respectively are somewhat fairly equated, yet so long as a simple solution offers itself, we need not search for a complex one. Remembering that the water-level of the Chalk, especially in the neighbourhood of large towns, is sinking year by year, owing to both natural and artificial causes,56 the existence of a higher level in Roman times can scarcely be contested. Whether as great a difference as, say 40 feet, may be assumed, is debatable. Again, a conclusion based on the comparison of one modern well with one ancient well, without close knowledge of the dip of the Chalk, of possible faults, of the presence or absence of swallows' and large fissures, is not unassailable. But in the two cases given, it is not a difference in level of 40 feet, but of 100 feet, which has to be accounted for. (Woodcuts modern well, 211 feet + 77 feet 288 feet ; Roman well, 188 feet.) Taking the greater limit actually asked for by Pitt-Rivers, namely 50 feet, such a rise in the water-level would not materially affect camps constructed at such elevations at Winklebury and Maiden Castle. Fifty feet will scarcely meet the difficulty, for Mr. Clutterbuck states that the water-level of the Chalk varies from 100 to 400 feet beneath that of the ponds,57 whose elevation generally corresponds with that of the camps. In the present state of our knowledge, the well theory must be deemed untenable. On the other hand, if we consider that General Pitt-Rivers's reasoning is valid, it will, while removing the necessity for dew-ponds, lend one more testimony to the belief in the existence of ancient hill-top communities. Once more ; a spring or bourne generally leaves some trace in the form of a gully or dry water-course, and this might actually be intensified after long sub-aerial denudation. Some traces of this kind should remain, because turfed ground is excellently adapted for the preservation of such features. Not to lose sight of the chief question, it must be repeated that the camps are largely pre-Roman, and we have to inquire how the inmates secured one of the prime necessities of life. The query becomes more pertinent if we leave Winklebury, and consider a ' contour fort ', like that of Cissbury, where we know that there was a permanent settlement of men engaged in mining and working flint. Not only was Cissbury, with a periphery of 1 miles, a settled camp, but it was doubtless occupied continuously from day to day, for we cannot suppose that the inhabitants climbed up the hill every morning and down in the evening, and that they carried with them a daily supply of water. Yet this must be conceded, if we reject the presence of wells or springs, unless indeed there is some fourth explanation forthcoming. There is such an explanation—the possibility that dew-ponds, or hollows of a kindred nature, were utilized. The evolution of the dew-pond, first suggested, I believe, by Mr. F. J. Bennett, is worth considering.58 The ditches of the earthwork camps would be constantly trodden down, first by the excavators, and afterwards by the members of the garrison and their impounded cattle. We have only to suppose a surface of Clay-with-flints, or any other retentive clay, and it is evident the fosses would soon contain water. Additional defence would thus be provided, and, during warfare, perhaps a supply of drinking water, in addition. Mists and dews would soon have free play, and the greater rainfall would keep up the reserve. In the course of time, the trenches might be closely rammed of set purpose. Finally, dew-ponds, imperfectly water-tight, no doubt, might be designed within or near the fort. The accidental puddling of trenches came under the writer's notice in April 1905, when examining the series of round barrows on Povington Heath, Dorset. The weather had been dry for many days previously, and the thirsty heath, save for an occasional bog, was much parched. Where, however, the trenches encircling the barrows had a slightly clayey bottom, the water was held up. The trampling of moorland sheep and cattle may have helped in the puddling, though in the modern artificial dew-pond, where specially constructed layers or crusts are concerned, such action would have a reverse effect. There have also probably always existed, here and there, a few natural dew-ponds, formed by depressions in the Clay-with-flints, or in Eocene clays. It may be objected that prehistoric villagers could not have understood the principle of dew-ponds. The objection is sound, but we reply, ' Neither would they understand, except experimentally, why a clay-lined earth-cavity, or a crude pan, would retain the water in which primitive folk are accustomed to parboil their meat.' Puddling was resorted to in each case. Experience was the only light, as it is to the average flock-master of the twentieth century. One repeats, though it ought not to be necessary to say it at all, that practice does not always involve a knowledge of theory. The theory of the development of dew-ponds above sketched may or may not be correct. But there is a coincident clue. Richard Jefferies, who shall be cited, not as possessing authority, but as one who had shrewd native insight in matters affecting agricultural economy, observed that two modern dew-ponds are situated near isolated camps in Wiltshire. He was led to infer that similar ponds could have furnished the only available supply to the ancient communities.59 It is necessary to state that in this and other counties modern ponds are sometimes found near old forts, but these instances of juxtaposition do not exhaust all the evidence. We may now reasonably ask whether some of the depressions in the vicinity of ancient earthworks were not dew-ponds. The hollows may be dry, or they may be choked with rank vegetation. They may, again, still be subject to swampiness, as in the depression which I have elsewhere reported from Henley Wood, Chelsham (Surrey).60 An oval hollow, quite dry, occurs a little distance away. Mr. Bennett records a small dew-pond at Ladle Hill Camp, Berkshire, which is probably of recent construction, but he also mentions several hollows, seen by himself and Major Cooper King at Perborough Camp (Berks. ), which may represent ancient ponds.61 A pond situated towards the South of Chanctonbury Ring, Sussex, in a direct line between that earthwork and Cissbury, is believed to be ancient, though it has probably been cleared more than once. Two modern ponds are to be seen in the neighbourhood. 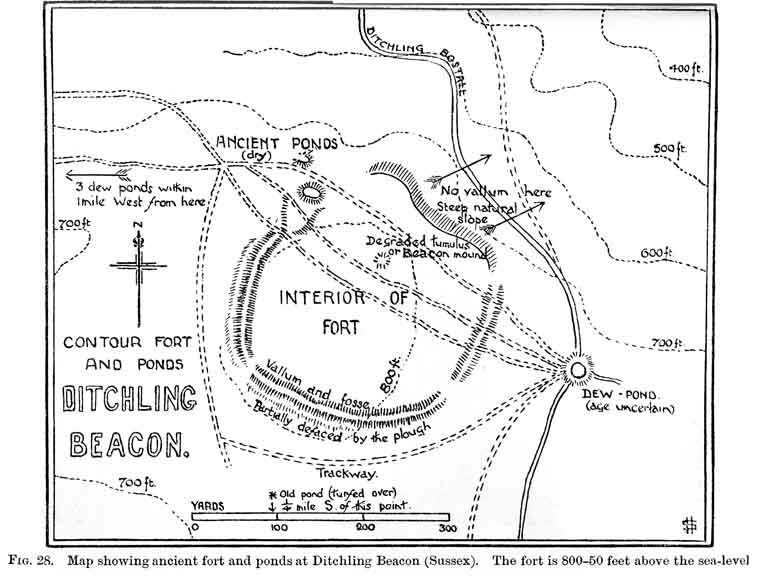 At the Eastern angle of the fort on Ditchling Beacon (800-50 feet) there is a dew-pond, probably of ancient date. There is also, at the North-west, what the historian calls a rain-water pond ', now dry, considered to be coeval with the earthwork, because the ramparts have been modified in order to induce supplies (Fig. 28).62 Another example may also be traced hard by. Other dew-ponds, of unknown age, lie to the West. Further examples can be given. Visitors to Maiden Castle, near Dorchester, may see, within the actual fort, what was probably an ancient pond. Messrs. Hubbard have described a dried-up dew-pond in St. Martinsell Camp, near Marl-borough." They give other instances, some of which must be received under reserve, until we know whether or not they are of modern construction. The only instance yet noted where the pond is within the camp is the already-cited case of the Dorsetshire Maiden Castle. It is suggested that, in the majority of cases, such a position would be shunned because of the trampling of cattle. I have tried to present Messrs. Hubbard's theories with all possible fairness, though I think that the writers go much farther than the data warrant. Before these speculations can be heartily accepted, more must be known. Mean-while the ideas offered to us stimulate thought and encourage a search for further details. Facts and opinions may now be gathered and allowed to converge. That many dew-ponds are of recent date admits of no question. Generally, the excavations have a recorded history of two centuries only. Probably, however, they existed from the fifteenth century onwards. They would not be needed in Norman and Saxon times. The old mound-builders required a good water-supply, and there is no available proof that the water-level of the Chalk was sufficiently high to feed the down-tops ; a definite verdict on this matter must nevertheless be suspended. Celtic farmers and their Neolithic predecessors cannot be proved on present testimony to have been well-sinkers. Lastly, hollows of the dew-pond kind would have served the purposes of the dwellers in the forts, though the ponds could not have been dug on scientific principles, being partially rain-fed, and occasionally failing of their purpose. And, indeed, all ponds situated at great heights must be to some extent fed by showers of rain and snow. If we accept the prehistoric dew-pond, we need not rush to the extreme of thinking it the only possible mode of obtaining water. On a hill of moderate elevation, with a favourable concurrence of geological conditions, intermittent bournes or lavants ' might serve very well. Advantage might be taken of natural or artificial runnels whenever there was a downpour of rain, no unusual event. Temporary camps or earthworks constructed for special purposes might be intentionally planned near running streams. Thus, ancient pits, presumably for habitation, once existed near a constant spring at Coombe Hill, Croydon,68 though no trace of either huts or spring is now to be found. Another most important consideration is that away from the Chalk Downs there were often alternative sources of supply. Hence, as with dwellings and settlements, there may have been contemporaneous diversities. The desertion of the upland camps and settlements led to new requirements and new systems. The Teutons who tilled the valleys needed the dew-ponds little, if at all. Springs and rivulets sufficed, otherwise wells were bored. When the down-tops were once more required as sheep-walks, dew-ponds would again be a necessity. Guided by experiment and observation, the Mediaeval husbandmen and shepherds trod safely the path along which the ancients, with more or less success, patiently groped. The folk-memory of ponds was, for the time, rejuvenated. Once more tradition failed, and once more it was taken up in the nineteenth century. Actual continuity of dew-pond construction has not been proved, perhaps cannot be proved. The same may be said of the very antiquity of the ponds. The archaeologist would be pleased were the feat possible, but it is entertainment enough to give reasons showing that the ancient and modern methods of the husbandman and the shepherd probably approximate. *1. For old theory, see W. C. Wells, ' Essay on Dew,' 1818 (preface dated 1814). Also good summary, T. H. Huxley, ' Physiography,' 1885, p. 54. *2. Trans. Roy. Soc. Edinburgh, xxxiii (1886), pp. 9-64. * Summary in Chambers's Cyclopaedia, 1904, iii, p. 782. 3. Eng. Dial. Diet., under Mist-pond'. *4. Rept. Brit. Assoc., 1900, pp. 585 et seqq. ; Nature, lxiii (1900), pp. 20-1. *5. W. Marshall, Rural Econ. of the Southern Counties,' 1798, ii, p. 398. Wiltshire dew-ponds are noticed in Wilts. Archaeol. and Nat. Hist. Mag., xvii, 1878, pp. 299-300. *6. Spectator, Nov. 16,1901 (lxxxvii, pp. 755-6). 7. Nature, lxii, 1900, p. 495. *8. G. White, Selborne ' (Harting's edition, 1880), pp. 225-6. Gideon Mantell, in 'Geol. of S.E. of England,' 1833, p. 9, n., quotes White, and mentions the natural stocking of ponds with animal and vegetable life. 9. Spectator, lxxxvii, p. 990. 10. E. A. Martin, in Knowledge, N. S., iii, 1906, p. 481. *11. A. J. and G. Hubbard, Neolithic Dew-Ponds and Cattle-Ways,' 1905, pp. 2-4 (speak of wandering band). Stationary workers referred to in S.E. Naturalist (1906), pp. xxxix, xl, 20. 12. Neolithic Dew-Ponds,' p. 3. *13. Nature, lxiii, 1900, pp. 20-1. 14. Knowledge, N. S., iii, 1906, p. 481. *15. H. P. Slade, A Short Practical Treatise on Dew-Ponds,' 1877, p. 30. 16. Ibid., p. 12. 17. Ibid., p. 6. *18. R. Jefferies, Wild Life in a Southern County' (new edition, 1889), pp. 25-8. *19. Rural Econ. of S. Counties,' ii, p. 398. Cf. E. Lisle, ' Observa-tions in Husbandry' (ed. by T. Lisle, 1757), ii, p. 406. *20. C. Reid, in Miall and Fowler's edition of White's Selborne,' 1901, p. 166, n.
21. Proc. Geol. Assoc., x, p. 377. Cf. Cobbett, Rural Rides,' i. p. 20. *22. J. Clutterbuck, in Jour. Roy. Agric. Soc., i (2nd Ser., 1865), p. 273. Cf. T. Davis, Wiltshire Agric.,' 1811, p. 13. *23. A. Collett, in Macmillan's Mag., N.S., i, 1906, p. 217. 24. Slade, Treatise on Dew-Ponds,' p. 20. 25. Ibid., p. 31. *26. C. J. Cornish, The Naturalist on the Thames,' 1902, pp. 129-30. A capital summary given in the Spectator, lxxxvii, 1901, pp. 775-6. 27. In Memoriam,' c. xi, v. 2. *28. White's Selborne ', Harting's edition, 1880, p. 226. The damp, foggy atmosphere of the Downs is well described in J. H. Shorthouse's John Inglesant ', 1887, p. 20. *30. White's Selborne ', annotated by Miall and Fowler, 1901, p. 164. Rept. Brit. Assoc. (1900), pp. 585 et seqq. *31. ' Neolithic Dew-Ponds,' pp. 2, 3. 32. Ibid., pp. 3-4. 33. Macmillan's Mag., N. S., i, 1906, p. 216. *34. Jour. Roy. Agric. Soc., 2nd Ser., i (1865), pp. 281-7. *36. Spectator, lxxxvii, 1901, p. 798. *37. Nature, lxii, 1900, p. 495. *38. White's Selborne ' (Miall and Fowler), pp. 165-6. 40. ' The Naturalist on the Thames,' pp. 130-1. *41. W. C. Wells, ' Essay on Dew,' p. 225. *42. Ganot, ' Physics' (12th edition, Atkinson, 1886), p. 961. 43. Ibid., p. 316 ; White's Selborne' (Miall and Fowler), p. 165. *44. Proc. Geol. Assoc., x, p. 377. 45. Slade, ' Treatise,' p. 6. 46. Jour. Roy. Agric. Soc., 2nd Ser., i, pp. 281-7. *47. Macmillan's Mag., 1906, pp. 216-17. *48. C. Vancouver, Agric. Survey of Hampshire,' 1813, i, pp. 47-8. * Cf. W. Cobbett, Rural Rides' (1886), i, p. 20. *49. C. Packe, Philosophico-Chorographical Chart of East Kent,' 1743, pp. 87-8. 50. Murray, ' Handbook to Kent,' 5th edition, 1892, p. 37. *51. C. F. Dowsett, Winklebury Camp,' 1904, pp. 4, 7 ; also Times, Nov. 26, 1900. *52. ' Excavations in Cranborne Chase,' ii, p. 237. *53. Ibid., i, pp. 10, 27-8. 54. Ibid., ii, p. 237. 55. Ibid., i, p. 28. *56. ' Neolithic Man in N.-E. Surrey,' pp. 25-6. *57. Jour. Roy. Agric. Soc., i, N. S., p. 273. *58. Trans. Newbury Field Club, iii, pp. 257-8. *59. R. Jefferies, ' Wild Life in a Southern County,' 1889, pp. 25-8. *60. ' Neolithic Man in N.-E. Surrey,' pp. 83-4. 61. Trans. Newbury Field Club, iii, pp. 257-8. *62. Vict. Hist. Sussex,' 1905, i, pp. 460-1. The Sussex ponds are dealt with in the abstract of a paper by A. H. Allcroft, Morley College Magazine (London), xvi, 1906, pp. 40-3. *63. Jour. Anthrop. Inst., 1889, xviii, pp. 336, 338, &c.
64. Cornhill Mag., No. 119, N. S., 1906, p. 617. *65. ' Neolithic Dew-Ponds,' p. 17. 66. Ibid., pp. 60-1. 67. Ibid., p. 59. 68. King, Munimenta Antigua,' i, pp. 150-1. Note.-Since this chapter was written, I have seen Mr. E. A. Martin's excellent articles in Knowledge, iv, N.S., 1907, pp. 108-9, 126-8, 197. Some slight additions have been in consequence incorporated, but in the main Mr. Martin's authorities are the same as those here quoted. The reader may, however, do well to compare Mr. Martin's summary with that of the text.